Kangsabati River (Pron:/ˌkæŋsəˈbɑːtɪ/) (also variously known as the Kasai and Cossye) rises from the Chota Nagpur plateau in the state of West Bengal, India and passes through the districts of Purulia, Bankura and Paschim Medinipur in West Bengal before draining in the Bay of Bengal. After rising at Murguma near Jhalda in the Chota Nagpur plateau in Purulia district, it passes by Purulia, Khatra and Ranibandh in Bankura district, and then enters Paschim Medinipur in the Binpur area. It is joined by Bhairabbanki. At Keshpur the river splits into two. The northern branch flows through the Daspur area as Palarpai and joins the Rupnarayan River. The other branch flows in a south-easterly direction and on joining the Kaliaghai River forms the Haldi River, which flows into the Bay of Bengal at Haldia. Kangshabati is created from the confluence of two smaller river streams namely Saharjhor and Girgiri and takes the name of Kangshabati near Tigra village of C. D. Block Jhalda II in district Puruliya. Purulia, Mukutmanipur, Raipur, Binpur, Midnapore, and Kharagpur are towns on or near the banks of this river. 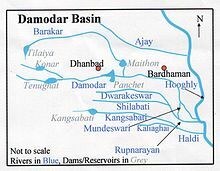 The Kangsabati Project was started in 1956 as part of the Indian Second Five-year Plan to provide water to 3,484.77 square kilometres (1,345.48 sq mi) of land in the districts of Midnapur(erstwhile), Bankura, and Hooghly. It involves irrigation land using water from the Kangsabati River, as well as the Shilabati and the Bhoirobbanki rivers. As part of the project, a 38-metre (125 ft) high and 10,098-metre (33,130 ft) long dam, Mukutmanipur Dam, was constructed at Mukutmanipur on the river Kangsabati and Kumari about 3.2 km upstream of their Confluence. It is an earthen gravity dam with concrete saddle spillway at the border of Purulia and Bankura district. An anicut dam built on the Kangsabati River near Midnapore in 1872 was also added to the operations of the project. Wikimedia Commons has media related to Kangsabati River. This page was last edited on 27 November 2018, at 23:03 (UTC).